რობერტ ნიუტონ ფორდი (ინგლ. Robert Ford; დ. 31 იანვარი, 1862 — გ. 8 ივნისი, 1892) — ამერიკელი ბანდიტი, რომელმაც 1882 წლის აპრილში, ჯილდოს სანაცვლოდ მოკლა თავისი ბანდის ლიდერი ჯესი ჯეიმზი. მოგვიანებით ფლობდა ბარებსა და საცეკვაო დარბაზებს კოლორადოში. ფორდი მოკლეს ედვარდ კეპეჰარტ ო’კელის ნასროლი ტყვიით 30 წლის ასაკში, 1982 წლის 8 ივნისს. ედვარდი ფორდს მოღალატედ თვლიდა, რადგან მან ჯესის მისივე სახლში, მისივე ოჯახის წევრების წინ ესროლა. სწორედ ეს გახდა ფორდის სიკვდილის მიზეზი. რობერტ ფორდის ძმა — ჩარლი, ჯესის სიკვდილს შემდეგ დეპრესიაში ჩავარდა და 1884 წლის 6 მაისს საკუთარი სიცოცხლე თვითმკვლელობით დაასრულა. Yeatman, Ted. Frank and Jesse James Nashville: Cumberland House, 2001.
შეგიძლიათ იხილოთ მედიაფაილები თემაზე „რობერტ ფორდი“ ვიკისაწყობში. Stories of the Century: "Jesse and Frank James". — Internet Movie Database. ↑ Stiles, T. J. (2002). 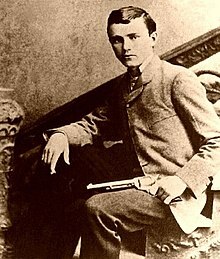 Jesse James: Last Rebel of the Civil War. A.A. Knopf, გვ. 363–375. ISBN 0-375-40583-6. ↑ Yeatman, Ted P. (2000). Frank and Jesse James: The Story Behind the Legend. Cumberland House, გვ. 264–269. ISBN 1-58182-325-8. ↑ Mault, Deena. (27 თებერვალი, 2006) [Ford Robert and Charles Ford ancestors]. RootsWeb. Ancestry.com. წაკითხვის თარიღი: 3 ივნისი, 2014. ↑ "Charlie Ford's Funeral". St. Louis Globe-Democrat. 8 მაისი, 1884.